Previously, on MinerBumping... The Knights of the Order won a hard-fought battle against an Orca. Nearly half an hour later, the Orca pilot finally woke up and convo'ed Agent MotherSammy. 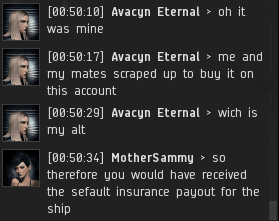 Our hero recommended that the carebear pay 10 million isk for a permit, but she claimed she was down to her last 0.5 million isk, and couldn't get any more, because she couldn't mine. 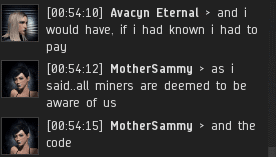 After Part 1 of this post was published on MinerBumping, MotherSammy did Avacyn Eternal the favor of inviting her to read it. Avacyn was furious. She insisted that she wasn't really AFK for 25 minutes--she merely took 25 minutes to respond because she was busy "calming down". You can tell this is true, because she was so calm during that convo. Avacyn also objected to the assertion that the mining drones found in her wreck had been used for mining. They weren't in use. 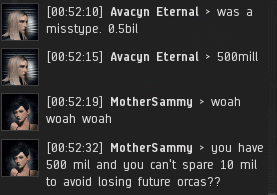 The Orca was there to provide bonuses, clearly not a task that could have been performed AFK. 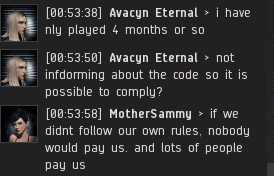 The EVEmail concluded with Avacyn's complaint that the MinerBumping post was "slanderous" and "borderline criminal". My dear Avacyn, there's no such thing as borderline criminal. Something is either right or wrong. 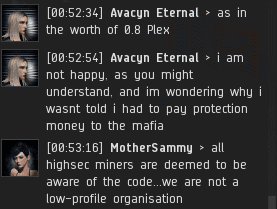 Violating the Code by mining in highsec without my permission is as criminal as it gets. Now, on with the show. MotherSammy and Avacyn's convo continued. Avacyn repeatedly insisted that she had been bankrupted by the New Order attack, and that she couldn't possibly pay. MotherSammy was skeptical. 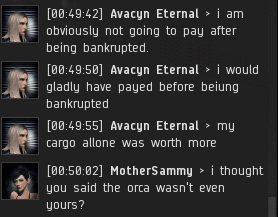 What about the funds Avacyn would have received from the default insurance payout when her Orca blew up? Avacyn suddenly realized she had the money all along. She still felt she needed a new Orca, though. MotherSammy wouldn't let up. She interrogated Avacyn about her earlier claims of poverty. 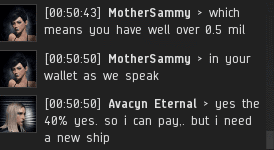 Avacyn made another sudden realization: She wasn't down to her last 0.5 million isk; she was down to her last 0.5 billion isk. A simple mistake, I'm sure. When someone asks me for 10 million isk, I always tell them, "Sorry, I only have 0.5 billion." Agent MotherSammy successfully established that Avacyn had plenty of money to spend on a permit. But Avacyn was slippery as an eel. What new excuse would she come up with? Next, Avacyn made the outrageous claim that she had never heard of the New Order or its Code. Even if she'd been living under a rock for the last year, she still would have heard of us. People who mine rocks talk about us all the time. 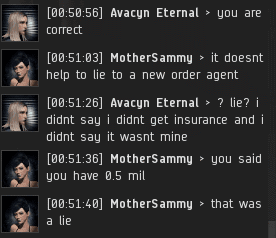 Once again, a "new" player of more than four months in EVE. This is no excuse. I know of plenty of people who first read MinerBumping even before they came to EVE. 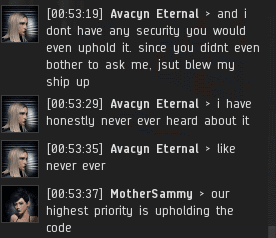 As for the rest, you can't spent four months mining in highsec without "bumping" into us. We're the only thing the carebears ever talk about in local. Avacyn opened her mouth to change feet. While making a disdainful remark about the Code, she admitted to watching YouTube videos during mining time. MotherSammy had her hands full with this carebear. Could she be saved? And another "Anonymous" poster shows the world his courage. These stories are getting boring, much like this website and the "organization" you run. Hmm, not many posts about people investing in shares much. No deployments to other areas of the EVE universe. I dare say it sounds as though The New Order is dying..little by little. You're old news Jimmy, and people are starting to get bored. I log onto this site hoping for something new and refreshing but it's just the same dull drivel day after day. Come on guys, we all thought you were better than this. What a shame. ^ Comments like yours certify that the New Order is alive and well. Do you read more than 1 article a month? Many people donate every month, as is reported in a monthly recap. Perhaps things would be less boring for you if you sent a personal evemail from your main mining spaceman to James 315 to inform him how boring everything is. It never ceases to amaze me how many miners lie multiple times in a single conversation. Not only do they lie, but they get caught in their lies by agents asking simple, common sense questions. When will these silly bears learn that it is so much cheaper to buy a permit and live the Code than to claim ignorance or flaunt carelessness. 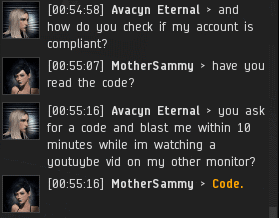 The only way things would get boring would be if every highsec miner decided at once to buy a mining permit and abide by the Code. Until then, we continue on our lives' calling to bring light to the darkness in every corner of space. At the very very start of MinerBumping and James' crusade (good or bad choice of word?) many intelligent miners made their smart business decision and paid the 10M isk and put the message in their bio as per Code regulation. While I won't attempt to claim that they upheld all of the code all of the time; the genesis of being smart and non-bot compliant was there. As time went by, the bot aspirant miners' lies got bigger and deeper; while the themes of their lies remain the same they're more likely to believe what they say. I wish I could have afforded a 500M hull three months after starting to play Eve, but back in 2004 I doubt there was that much ISK floating around. There has never been an excuse not to support the New Order at such a low rate and common sense Code compliance. I seem to recall someone deliberately getting James name wrong in a somewhat recent minerbumping entry... A possible link perhaps? "This is blatant lying. even after i payed you. ..." I would like to point out that at the time of this email, and gank for that matter, no Permit had been purchased for Avacyn Eternal. Also, glad he was now finally paying attention to local and not alt tabbed. Too bad it was after the fact, of course. And convo'ing your neighborhood NO agent is more important than talking to other miners in local chat. I am still hopeful that we can have a happy ending. Perhaps Avacyn collected her nerves and thought logically about what transpired. Perhaps she later apologized, paid for a permit, and invested significantly in the New Order once she realized how very wrong she was? Maybe she convinced her entire corp to buy permits? Has someone informed her that her ceo can buy bulk permits for the entire corp? For instance, a 100 permit bundle pack only costs 1b isk when you buy them in bulk. Erotica, how's your business so far? Your eve-o thread hasnt had much posts lately. who was the last poor guy in the bonus room? Since my return from a month long sabbatical, I have had to bonus events in 2 days. Perhaps you will be able to read the fascinating tales of how they went soon on this very news site. *2 ugh, spelling like a miner since I have to run out the door. Looking forward to read the news, always interesting seeing how people's greed is your profit. Out of curiosity, have you ever contacted past "players" from bonus room after the bonus room? Oh and welcome back, i suppose.